On Saturday, March 30, members of the Fryeburg Academy Vocal Jazz Ensemble performed at the Maine Music Educators Association Vocal Jazz and Show Choir Festival, where they earned the coveted Gold rating. The ensemble routinely performs professional and college-level arrangements, and this year they included two charts by Darmon Meader of New York Voices, which the group had learned to perform with Kim Nazarian — the Grammy-nominated soprano from New York Voices at their annual jazz residency. The set opened with a special two-choir arrangement of Duke Ellington’s “Bli Blip,” featuring senior vocalists David Marshall, McKenna McGrath, Sam Paulding and Georgia Stafford in a vocal quartet, and freshman Willow Carter, sophomores Arlo Stephenson and Bailey Richardson, juniors Tianyi Ma, Alanceiah Waiters and Ethan Reinbach, and seniors Jessica Frum and Gracie Vaughan composing the second choir. That tune also highlighted vintage swing style by senior Yukon King on guitar and sophomore Jaden Fierman on upright bass. The group slowed down with Gene Puerling’s six-part a cappella arrangement of “Over the Rainbow,” which featured Arvin, David and Georgia on solos, and included pianist Silvia Sanchez-Serra and drummer Matthew Gunther in the choir. The group was then joined by sophomore Brendan Simkins on trumpet, soloist Simon St. Pierre on alto sax and junior Patrick Malia on trombone, as Jaden switched to electric bass, and Matt showed off his creativity on cymbals to close with an uptempo samba version of Paul Simon’s “Me and Julio Down by the Schoolyard,” featuring Alanceiah, Arvin, Willow, Georgia and McKenna. The students’ dedication and many evening practices paid off for them, earning the group their 14th consecutive Division I State Championship and their fifth under the direction of Mimi Rohlfing. 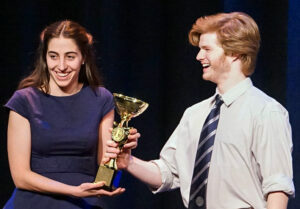 Georgia Stafford, who won the Berklee High School Jazz Festival Solo Singing Competition last year, was named one of four Outstanding Musicians for her solos and her sophisticated vocal improvisation on “Bli Blip.” All FA soloists were given the highest ratings possible, and the group was praised for their engaging stage presence, focus and versatility. 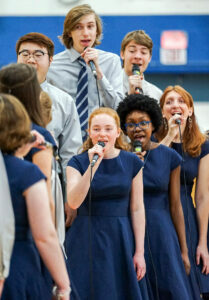 The Vocal Jazz Ensemble will perform at Fryeburg Academy’s Spring Concert on Thursday, May 9, and the competitive set have its final showing at All-Town Chorus Night on Tuesday, May 14. Those performances will be free and will take place at 7 p.m. in the Leura Hill Eastman Performing Arts Center at Fryeburg Academy.